I thought it would be appropriate to lead off with one of the most well known hot dog places in the area, Top Dog in scenic Rockport, Massachusetts. 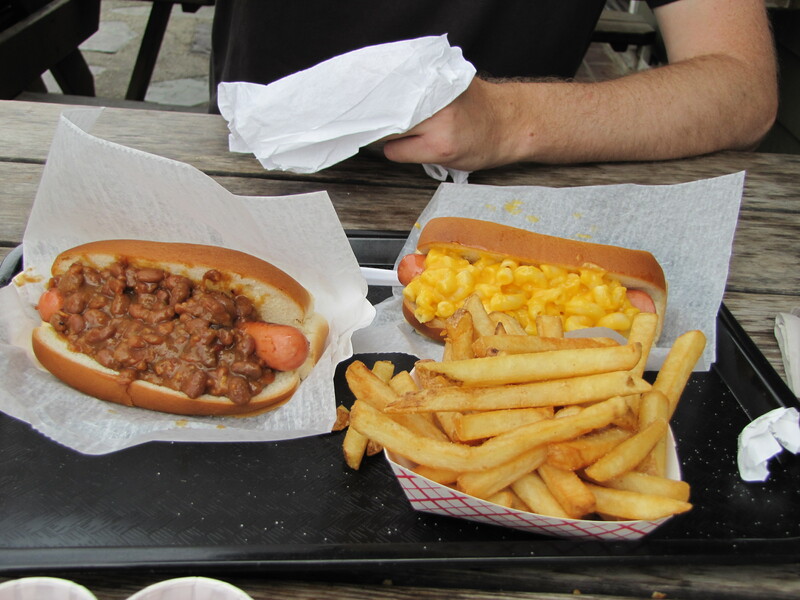 Top Dog has won numerous Boston-area accolades for being a great hot dog eatery. 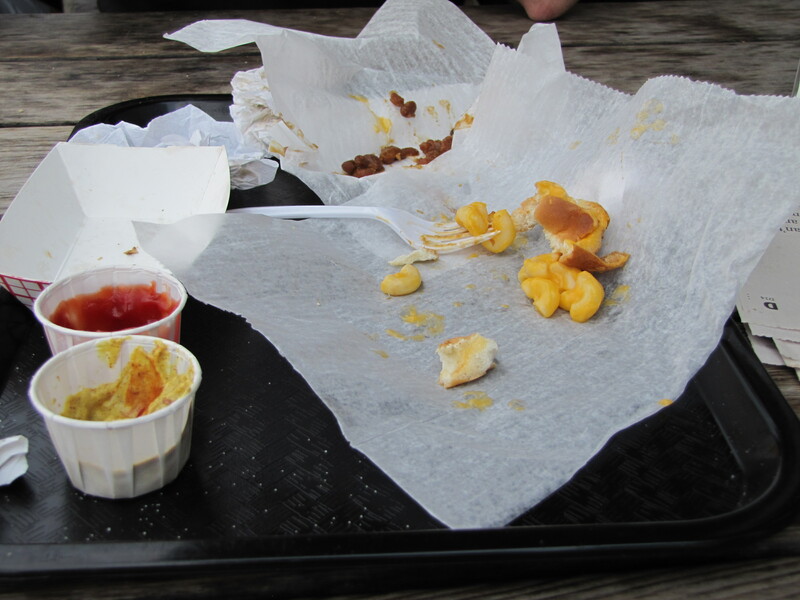 It was even recognized by Bon Appetit Magazine as one of the Top 5 hot dog places in the East. Impressive and it definitely made it worthy of a Sunday drive down to the seaside town of Rockport. On a very busy street, Top Dog looks like a big draw for tourists and locals alike. The line was out the door but moved quickly as the staff was working like a well oiled machine. Outside was a sign that had the menu posted on it and details of what each dog was. Creative points for the names, each after a breed of dog. Prices were very reasonable – especially considering the location – between $2.75 – $3.75, depending on what you wanted on your dog. For our maiden voyage to Top Dog, we had to try the Golden Retriever, a hot dog topped with Mac and Cheese, that we had heard so much about. For variety, we also ordered a Boston Terrier, which was topped with Boston Baked Beans. The dogs themselves come steamed or grilled, as do the buns. They were tasty and had some snap to it and would have been fine with no toppings at all (the purebred), but the real star of the show is the toppings. Rolls were of the standard variety and came overloaded with your topping of choice. Condiments like spicy brown mustard, ketchup, relish, chopped onions, etc. are self service. The mac and cheese was just what you are thinking in your head right now – cheesy goodness all around. Baked beans is one of my favorite hot dog toppings and this was a very solid option as well. Other dogs that sounded tasty and will have to be tried on a future visit: Chihuahua – Jalapenos, Salsa and Cheese; Shaggy Dog – Fresh Coleslaw and BBQ sauce and Man’s best friend – chili, cheese or both. Plus, you could customize your own dog with the Mutt, giving you a choice of any two toppings and the Junkyard dog, which allows you to choose an unlimited amount of toppings on your dog. In addition to the dogs, Top Dog also offers fried clams, chicken fingers, lobster salad rolls and more for those that may not be in the mood for a delicious dog. They have solid side options as well with fries, potato salad, clam chowder, chili and mozzarella sticks. Because of the variety of toppings, this is the type of hot dog place that you absolutely need to visit more than once. During peak summer days, it is going to be pretty crowded, but once you bite into a dog outside on the picnic table looking at the water, you won’t be thinking about how much time you just spent looking for a parking spot.